*Tonight Paul and I hearkened back to the days of old as we dressed up as the King and Queen and proceeded over the Kellogg High School Choir’s Department’s Renaissance Dinner in the KHS Cafeteria. 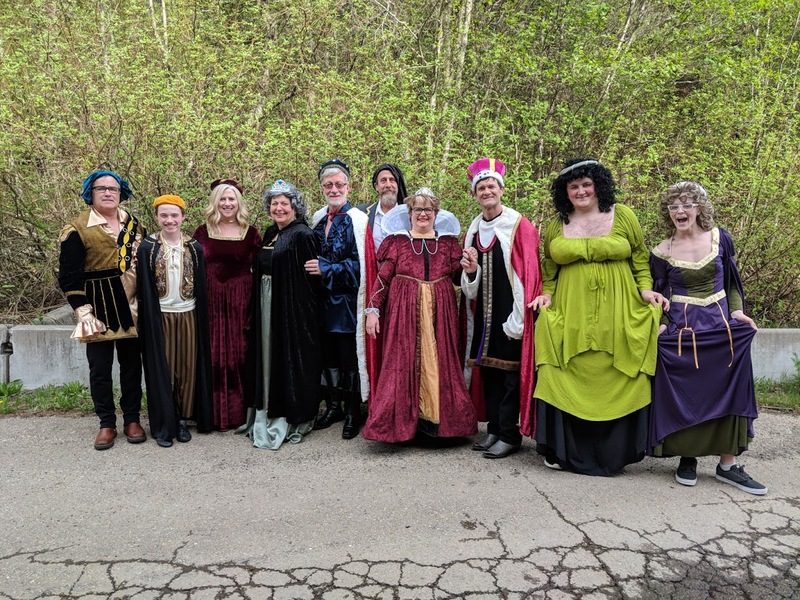 It was a wonderful evening filled with beautiful singing from the choir members, putting people in the stocks, making toasts, watching funny skits, and having all the single girls perform the Maypole Dance at the end. It was a delicious dinner prepared by current and former KHS Cooks, and a good time was had by all. Thanks to Gordan Turner, Carolyn Turner, Nate Turner, Cherri Bartle, Ken Bartle, Keith Mckay, Paul Roberts, Drake Duce and Jeremy Rosecrans for being such a fun group of people to sit and eat with at the head table!! *After returning home from the dinner, I spent some time walking around the backyard. It was a lovely evening last night. I enjoy walking around the yard and seeing what is blooming and what seeds are sprouting, and everything seems to be loving the combination of sun and rain we are receiving this week. *Our cat Clark continues to be a sense of amusement in our lives. He is always out and about in the backyard when we are out there working or walking around. Here he found a place to chill so he could survey what we are doing. He kind of looks like he doesn’t want to be messed with up there! !